Do you worry about the future? If you have a few moments here and there, you’re just being human, but if your mind spins and you can’t stop thinking about all the possibilities of what might happen this blog is for you. Worry is really a fear of what might happen sometime in the future. We expend a lot of energy doing this. So much so that we let other priorities of the present lapse or sometimes get pushed aside while we worry and wonder how something will come about. In Wayne Dyer’s book The Gifts of Eykis he speaks of two planets that look identical, but are very different. On the second planet when people worry they can hit the fast forward button to see if what they are worried about comes true. And if it does, they take steps to prevent it if possible. He makes the point that worry, without the fast forward button, which we don’t have here on this planet, make worry a waste of time and energy. What’s the point? He says. I agree with Dr. Dyer. 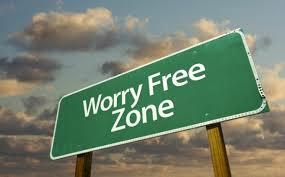 Worry can be a huge waste of time, energy and sway us from our priorities and purpose in our life. So what can you do? First, just become aware you are spinning if you constantly think about something that might happen. Second, when you become aware of it, make a conscious decision to stop thinking about it in that way. Third, change your thought patterns. Start imagining the very best result instead. Feel into the image of how wonderful that would feel and notice how your mind shifts and the energy rearranges itself in your mind. The more you practice the third step, which is really quite fun by the way!, the more the worry will take a back seat and your mind will stop spinning out of control. You’ll feel calmer, happier and feel more expanded vs. contractive, upset and tense. Worry is a waste of your present. It is energy you could be spending in a different, more productive way. Can you release worry and let your future be the beautiful magical thing it could be?